Founded in 2016, the company main focus is marine bunker, lubricant supply and trading. Galaxy Eco Services was quickly embraced by the industry striving to build a reputation as a reliable partner-supplier. Galaxy Eco Services is a major recognized player in the local bunker market. This has been achieved through a client oriented approach, strong financial management and highly skilled and trained team of professionals. 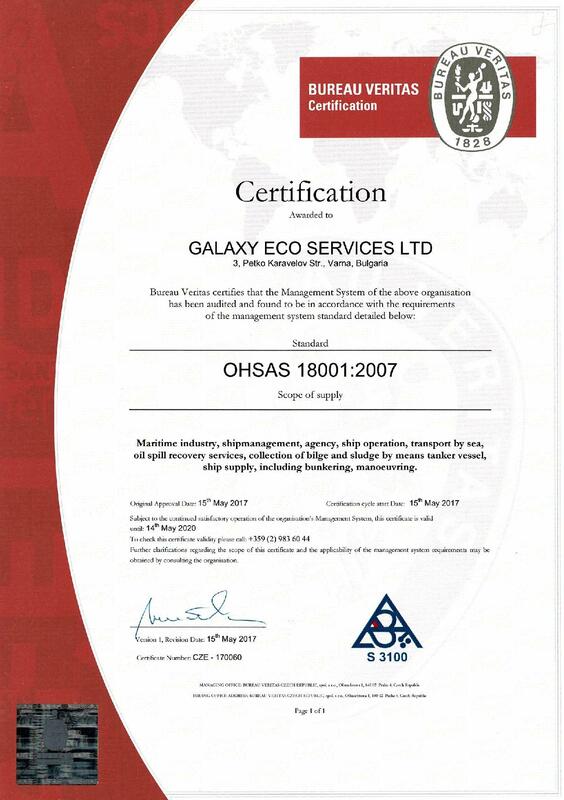 Galaxy Eco Services is characterised by a strong management team, qualified and motivated staff, operating within a ‘total quality’ philosophy. A client-oriented approach has distinguished it among its competitors. Galaxy Eco Services maintains the flexibility and unique character its clients are accustomed to. Since its inception, the company’s aim has been to ‘add value’ to its clients’ requirements by offering quality products and services at competitive prices and cutting edge comparative market intelligence. This optimises the client’s position in, what is, a complicated and volatile global supply market. Galaxy Eco Services’ experience ensures the smooth handling of clients’ bunker requirements from enquiry to nomination, post-fixture and delivery. The management philosophy remains customer focused and the broad range of services now offered is testament to the strong partnerships with clients and suppliers. The Customer is our primary business focus. Through our actions we will endeavour to create a relationship of trust and benefit. We will recognize their accomplishments and contribution by rewarding them fairly and by stimulating them to approach their work with commitment and enthusiasm. In return we expect our people’s loyalty and their adherence to our codes of practice and rules of behaviour. In particular we expect our people to accept responsibility and strive to improve team performance. Our team comprises of young professionals – a sparkling mix of passion for the sea and professionalism. We will constantly enhance our team’s skill and ability to meet the challenges of the ever-changing maritime industry. Development and innovation are essential for our future success. We search for new products and services that will satisfy the comprehensive needs of our customers, thus drawing closer to the concept of one-stop shopping. In the process, we foster and encourage our clients and personnel. To be the leading marine fuels supplier in the Southern Black Sea and in other strategic areas of our choice, distinctive in the quality of our services and the preferred supplier to the industry. Our passion is to create the desire amongst all our people to make changes in the pattern of their behaviour to ensure that our Mission Statement is acted upon. We are keen on providing our customers with the excellent quality services from beginning to end in the fastest time possible on a 24/7 basis. With an objective to win over our customers’ confidence and trust, we are confident of achieving goals through commitment. 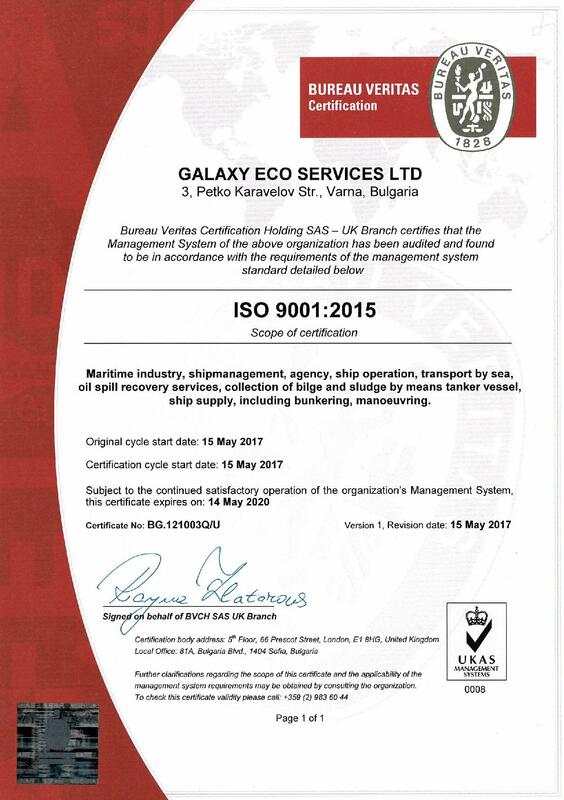 Galaxy Eco Services has an accredited quality management system that is continuously monitored and updated to ensure that all services and products offered are of the highest standards and quality. Continually improving quality in its products and services. Increasing awareness toward health, safety and environmental protection. Meeting or even exceeding customer and supplier expectations. Cultivating a supportive environment and teamwork. Monitoring and further enhancing the effectiveness of company processes. The company’s policy, targets, results and objectives, which are reviewed annually, are communicated within the organization accordingly. Providing a suitable working environment which is in compliance with relevant codes of practice, ensuring appropriate standards of Health & Safety. Placing the highest importance on safety by performing a Risk Assessment in order to identify hazards, determine risk levels in the workplace, put adequate measures in place to control risk and ensure that they are monitored. Safety of personnel and the environment taking precedence over considerations of commercial expedience. Maritime industry, shipmanagement, agency, ship operation, transport by sea, oil spill recovery services, collection of bilge and sludge by means tanker vessel, ship supply, including bunkering, manoeuvring.